A few of us attempted it, some using GameMaker, others using their own development tools and me using C++ with TurtleBrains. C++ is notorious for being slow during development. For years I’ve considered it just lacking a solid framework to build with, and am hoping to provide that with TurtleBrains, maybe the language is the barrier, but a solid framework should help. In any event, it took me 17 minutes to get a blank project to a black screen. 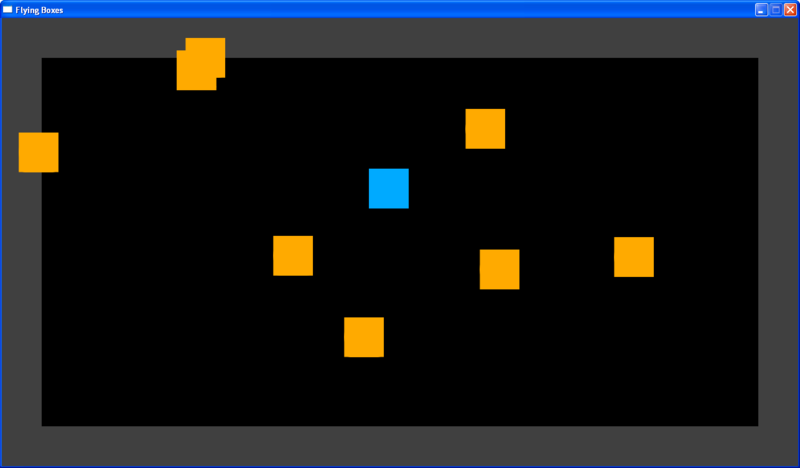 With forty-three (43) minutes remaining I decided to go with a game where you control a square and several other squares fly across the screen. Goal: Don’t contact another square. I created an entity for the flying squares, the gameplay scene and got the mouse moving the player square with others randomly moving at their set velocities. Time was up. No collision, no win, no loss, no sound, no graphics – beyond the colored square. And that was an hour. As expected the results were less than spectacular but the room for learning continues. There wasn’t much time wasted, probably 2.5 hours including the pre-jam and post-jam irc discussions. I was happy with my results given 17 minutes to get to black screen. This entry was posted on Wednesday, April 29th, 2015 at 1:22 am and is filed under Game Development, LudumDare, OneHourGameJam. You can follow any responses to this entry through the RSS 2.0 feed. Both comments and pings are currently closed.